From August 24-26, a solid blend of shufflers at SDSE consisted of new players and veterans. With that, you have the formula for a fine Maxine Trachsel Memorial tournament. Good numbers of competitors took to the boards as 64 players unleashed their strategies in a CSA Singles, 12-frame contest. Two SDSE ladies served double duty as ATM’s and creators of the charts, Lynda Goggin and Helen Noeltner. The boards were carefully groomed by Bill Ferrone, Scottie Lundie, Art Leseberg and Joe Jackson. Head ref was George Hayner which left collecting and collating the score cards in the hands of Karla Winget. Once again, Annette Elias rounded up gift certificates from these merchants: Applebee’s, Arturo”s Restaurant, In n Out Burgers, Jo Dawn at Shear Concepts, Marco’s Pizza, Mickey’s Yogurt, Polly’s Pies and The Melon Shed. We gratefully acknowledge the effort and time put in by these volunteers and thank them sincerely. The Bank of Hemet was making financial contributions to the budget, as well as the “kitty” from the player’s fees. Again, Muchas Gracias! This led to fine cash payoffs and a list of much appreciated door-prize drawings. 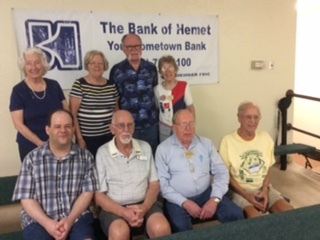 The Bank of Hemet representative Summer Zeigler was welcomed to the club to hand out the door-prizes. We thank her for her contribution. Vicki Dumars and Betty Elias served as our luncheon hosts. A nice variety of selections were available from day to day. It’s well worth repeating: What are the elements of successful shuffleboard play? Canadian Martine Vermeire casually recounted, “shuffleboard is 25% good luck, 25% bad luck and 50% know-how”! These are the 8 players who saw that honing of their skills really paid off. First, Robert Brooks, second, Jay Davidson, third, Roland Schneider and fourth, Dean Grattidge. First, Jean Estes, second, Janet Langemeire, third, Leroy Zerr and fourth, Ruth Schneider. Congratulations to all winners and all other competitors. Coming up next: The Any Doubles at Hemet West from September 9th to 11th. See you there.